South Korean rapper Psy brought his hit "Gangnam Style" home Thursday with a raucous free concert in Seoul, capping a month of global chart success that turned the chubby 34-year-old into a national hero. 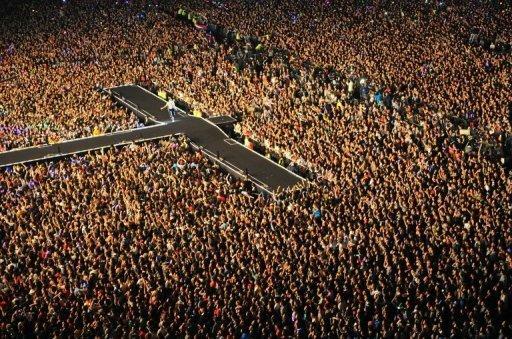 The municipal government closed off part of the city centre and extended subway operations for the estimated 80,000 fans who packed the open venue outside Seoul City Hall and spilled out into the surrounding streets. "I did not get here because I was worthy of it. I'm here because of all of you. I'm just a fat man with two kids," the singer told the ecstatic, dancing crowd at the show -- streamed live to an international audience via YouTube. "It's a golden opportunity to show the world how well we Koreans play," Psy shouted. The video to "Gangnam Style", featuring Psy's much-imitated horse-riding dance, went viral after its July release on YouTube, where it has now notched up more than 350 million views. Almost overnight, Psy was transformed into South Korea's best-known cultural export, succeeding where the manufactured girl and boy bands of the homegrown "K-pop" phenomenon have failed, by breaking into the US market. Despite being sung almost entirely in Korean, the song is currently top of the British charts and number two on the US Billboard's Hot 100 chart. During a hugely successful US promotional tour last month, Psy made a guest appearance at the MTV awards in Los Angeles, taught his signature dance to Britney Spears, and was given a cameo role on NBC's "Saturday Night Live". His horse-riding moves have been imitated, parodied and referenced in almost every conceivable context. Jay Leno's "Tonight Show" produced a mock-up video showing US presidential candidate Mitt Romney doing the dance at the Republican convention, while West Indian batsman Chris Gayle has adopted it for his celebrations at the ongoing World Twenty20 cricket tournament. The Gangnam of the title is Seoul's wealthiest residential and shopping district, lined with luxury boutiques, top-end bars and restaurants frequented by celebrities and well-heeled, designer-clad socialites. The video pokes fun at the district's lifestyle, with Psy cavorting through a world of speedboats, yoga classes and exclusive clubs. 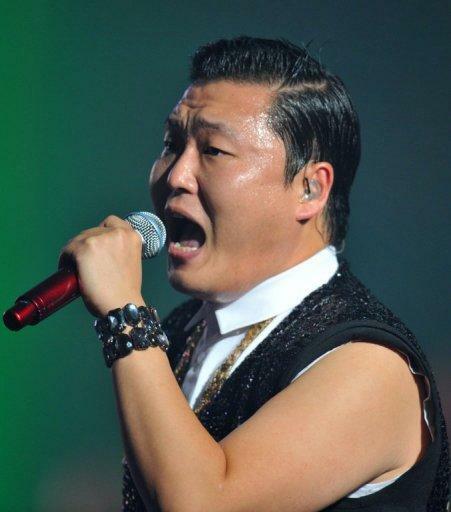 Psy, whose real name is Park Jae-Sang, is a product of Gangnam, having been born in the district to affluent parents. A relative veteran after more than a decade on the Korean music scene, Psy had previously built up a loyal fan base that stuck with him through numerous ups and downs, including an early brush with the law for smoking marijuana. While some articles in the Western media have suggested Psy's overseas popularity may be linked to negative Asian stereotyping, the overwhelming Korean response to his success has been one of national pride. Thursday's concert may have climaxed with the entire crowd horse dancing to "Gangnam Style", but it kicked off with a mass rendition of the Korean national anthem. The South Korean government sees popular culture as a potent export force that provides international exposure for a country that still feels overlooked compared to neighbours China and Japan. It has expended substantial time and money supporting the so-called Hallyu (Korean Wave) of TV shows and pop music that swept across Asia in the past decade. "It definitely helps in our branding efforts," Lee Bae-Yong, chair of the Presidential Council on Nation Branding said of Psy's global breakthrough. "K-pop like Gangnam Style serves as a spearhead in promoting Korean culture, economy, art, tradition and people," Lee told AFP.